A 45-year-old from Llantwit Major has won a gold medal in the final of a national skills competition. 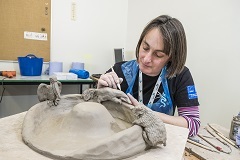 Ruth Johnston, who is studying a part-time Foundation Degree in Ceramics at Cardiff and Vale College, competed against four other students from across Wales in a series of heritage crafts challenges within a four-hour time period. The competitors were tasked with creating a piece of art which enhanced and complemented a piece that the competitors had designed previously, and were given the option of using one of four different materials; porcelain, terracotta, raku wear or St Thomas clay. Ruth said: “I decided to expand on what I had made previously, which was a thrown pot based on one of the animals featured on the animal wall surrounding Cardiff Castle. For the final, I created the animal wall itself, this time featuring different animals, surrounding a motte and bailey castle. “I’m currently studying for a part time degree, while also working as a freelance environmental consultant. In the future, I’d like to start selling my own ceramics.